Review - Hey! That's My Fish! Deluxe! Hey! That's My Fish! Deluxe! Hey! That's a lot of exclamation points! Really! Yeah. I don't think I can start a review of this game without talking about the title. Just look at all those exclamation points. Now, I am looking here specifically at the copy of the game in my possession, which is the Phalanx deluxe edition. The game has since been republished by Fantasy Flight Games, and I believe they have removed all but one of the exclamation points. It's a good call. The biggest problem with the title, and indeed the theme in general, is that is gives a false impression of what this game is really like. 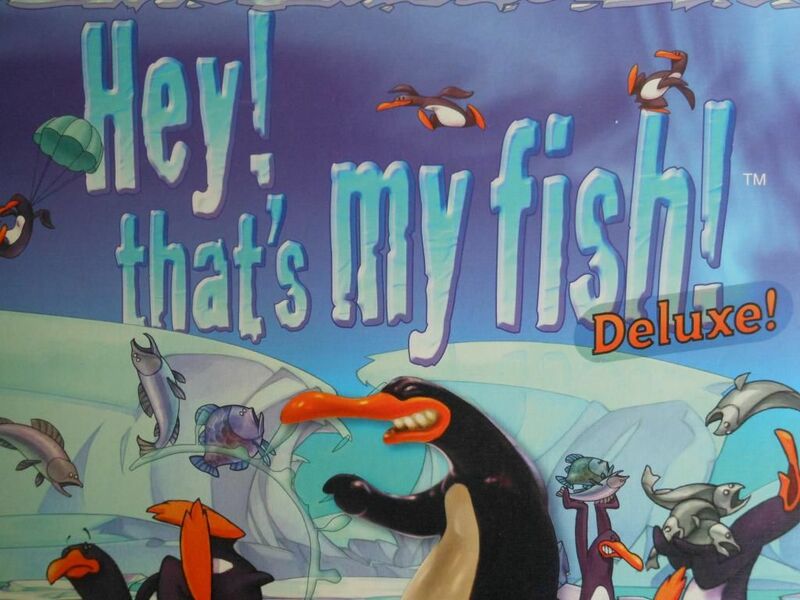 Looking at all those exclamation points, and those kooky graphics of penguins slipping around on the ice juggling fish, you might be inclined to be believe this is a children's game. It really isn't. The rules are simple enough for children to play, but there is actually a satisfying depth to the strategy and tactics involved that make this a good game for adults who want something simple to learn, but tricky to master. 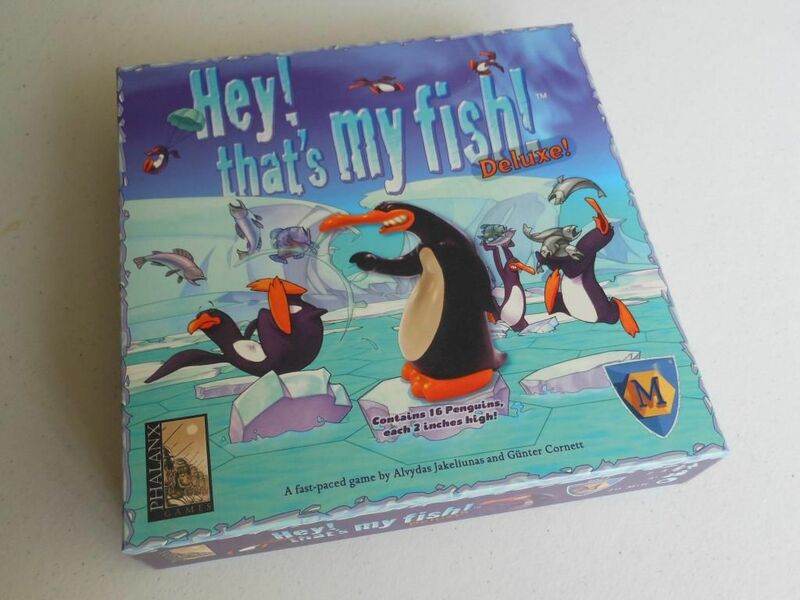 When this game was first released, it came with cardboard tokens to make the board, and little wooden penguins. It was subsequently released as a deluxe package featuring 16 really nice, pre-painted penguins. Of course, I bought the deluxe edition. Superman, Silver Surfer, Disco Stu, and Evil Monkey. The new Fantasy Flight edition falls somewhere between the two extremes. 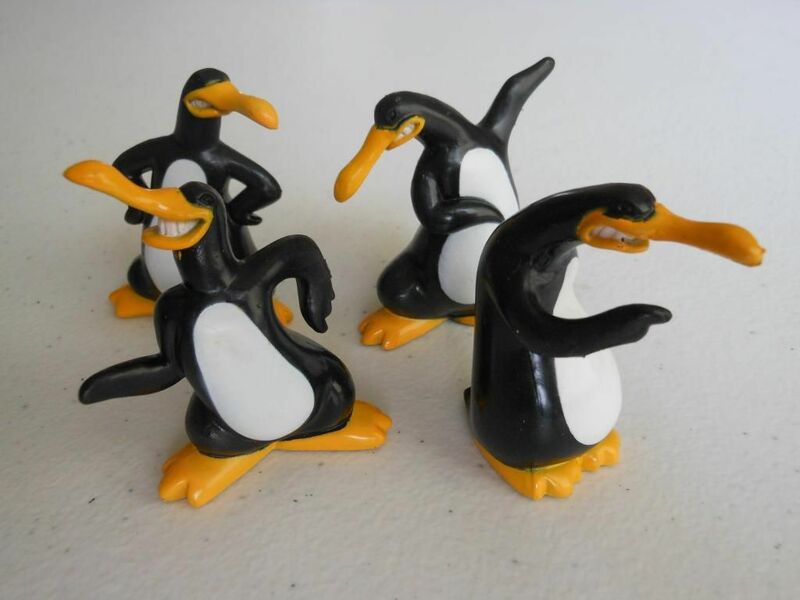 It gives you cute plastic penguins to play with, but they aren't pre-painted. 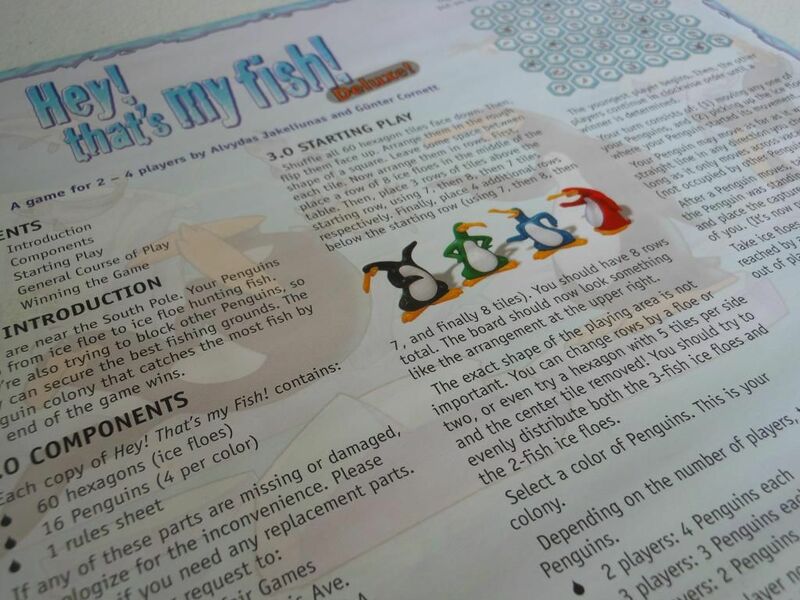 Anyway, the game ships with 16 penguins, in four sets of colours, and a bunch of cardboard hexagons with fish printed on them that represent ice floes. No cards. No dice. No tokens. Just the hexagons that are used to make the board, and the penguins. It's quite refreshing to have a game with so few components. It's even more refreshing when the rules for that game are printed on a single sheet of paper. Hey! That's My Rulebook! Concise! You start playing by shuffling up the 60 hexagons, and then laying them out in rows to form a square shape (or any other shape you fancy, but square is best). Some of the hexagons have one fish on them, some have two, and some have three. Each player then takes a number of penguins from two to four (depending on the number of players), and starting with the youngest player, the players take turns adding one penguin to the board. Once that is done, you are ready to play. The game literally takes less than a minute to set up. In your face Arkham Horror. Gameplay is just as simple. In turn, each player picks one penguin to move in a straight line in one of the six directions available from the hexagon the penguin is currently on. The penguin can move as far as it wants until it reaches the edge of the board, or its path is blocked by another penguin. A penguin can never jump over another penguin, and must always finish its move on a space with no other penguins. Once the penguin has finished moving, the hexagon it started its turn on is removed by the player and set aside. That hexagon is worth a number of victory points equal to the number of fish printed on it. The space on the board where the hexagon used to be can no longer be travelled over, and will block movement in the same way as the edge of the board or another penguin would. Hexagons that cannot be reached by any penguin are removed from play. Play continues in this way, with players scoring points, and gradually causing the board to disintegrate, until there are no moves left to make. When a player cannot make any more moves, he removes his penguins from the board, along with the hexagons the penguins were standing on. Then scores are added up to see who has won. Hey! Some of Those are My Fish! Probably! As you can see, the rules are incredibly light; and yet the game offers a surprising amount of brain-burning enjoyment. On your turn you can only move one penguin, and this can create some agonising choices. 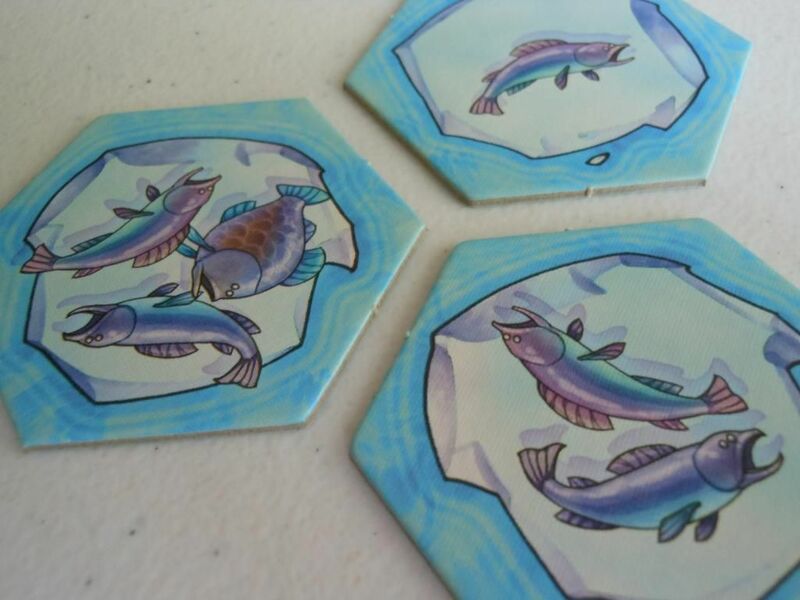 Do you block your opponent, or do you go for another three-fish hexagon? Do you go for a high-scoring hexagon this turn with one of your penguins, or do you move a different penguin to make sure it doesn't get blocked in by your opponents? Figuring out how to maximise your moves, preventing your opponents from scoring while grabbing all the fish yourself is quite a challenge. As the game progresses, and there are more gaps that will block movement, and a greater chance of finding yourself being blocked in, you can really be faced with some tough decisions. Hey! That's My Fish! Box! Now, I'm not suggesting this is the new chess; but I am suggesting it is a lot deeper and more tactical that the silly theme and even sillier name suggests. It is also a game that younger children can play, as the rules are so easy to learn. I have had this game in my collection for quite a long time now, and I have no intentions of parting with it. It isn't a game you are going to play all the time, but it is a great filler that gives your brain a bit of a workout without being too strenuous. Still not convinced? Well, how about this for a good reason to buy: It can be picked up for less than £10 on Amazon. And, you know, it has cute penguins. Thanks for this review of one of my favorite games. You can also get this for iOS for around $5, and the computer plays pretty well on the 'hard' level (though the 'easy' level computers are complete dunces). It's similar to one of my favorite abstracts, Amazons. Nicely done finding the cool deluxe copy! Thanks. I love the deluxe edition. The penguins are really chunky and quite nicely made. I might take a look at the iPad edition. Thanks for the heads up.